We are pleased to introduce our followers with the UL SPIE Student's chapter members and their everyday lab occupations. 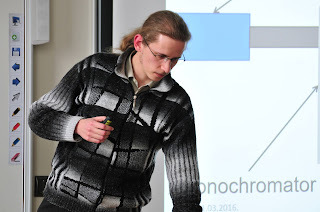 Raitis Grzibovskis is a PhD student, working in the Institute of Solid state physics, Laboratory of Organic materials. He is a SPIE member since 2012. Raitis had started his research carrier with photoconductivity measurements of organic materials, later continued with organic photovoltaic cells studies. Now, work is focused on more fundamental research - studies of interaction between organic compound and metal or other organic compound. Raitis representing his research at the conference "DOC 2016"
From now, you will be able to follow series of articles about topical researches done by our UL SPIE Student chapter's members. We are eager to offer news and feature stories covering all fields of science, especially optics and photonics, technology, engineering and math in order to encourage promising young scientists to launch their successful careers: from small discoveries to great victories. Let us start with our member, physicist Bc.Sc. 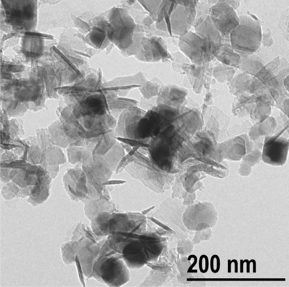 Paula Jankovska who had been working with aluminium nitride nanopowder spectral characterization (supervisor: Dr. habil. Baiba Berzina); and learn more about her novel investigations.